Article from The Daily Wire by Daily Wire Staff. It worked against Roy Moore. As long as the false accusers and their funders are not charged for their crimes, what do they have to lose? Communists have no morals. It also worked against Herman Cain and was tried against Dr. Ben Carson. I don’t think it will put an asterisk by his name because I believe 99% of Americans and the rest of the world already know that this is nothing more than another demoSCUM scheme to halt a President Trump nominee. These scum have played this card before but we can NOT let it work this time. Judge Kavanaugh is too good of a man to fall prey to these low life trash. I can’t put into words how low I think the whole demoSCUM party has sunk into the sewer. 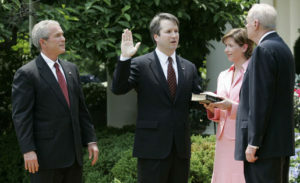 Welcome to the Supreme Court, Judge Kavanaugh… There is nothing as crooked as a Loser Demonrat. Let’s clear this up in the November Mid Term Elections…VOTE VOTE VOTE the crooked Dims OUT !!! Can’t voters see that this is taken out of the Democrat’s playbook? Are they really that stupid? I am a white woman and I see Christine Ford as a liar and fraud. Don’t let the left win! Confirm this very qualified man to the Supreme Court!